I've seen this happen several times. Somehow, someone creates a file path that is longer than Windows can handle. For some reason Microsoft Windows allows you to create a file path with more than 255 characters. If you want to remove something like this it normally requires some complicated Batch file using a downloadable executable or some genius script writing. 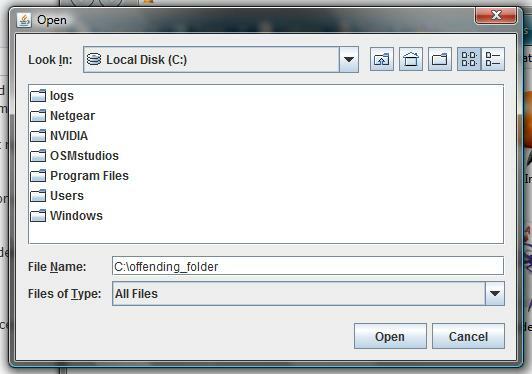 If you'd like to forgo these operations, OSMstudios provides a simple downloadable Java file that you can execute on a computer. Warning: This file will delete ANYTHING you pass to it! Be sure you have chosen the correct directory. Click here to download the PathTooLong application. If you receive an error concerning jdk 1.6 or similar verbiage you can either update your Java runtime environment or click here to download an older version of the PathTooLong application.